Before I say another word, I just want to tell you how exciting it is for me and the delegation from the rest of the Province to be here at last, on your beautiful island, on this historic occasion. But more about that in a moment. As Metropolitan of the Province of Southern Africa, it is a great honour and privilege on my first visit here to welcome you to this service. A very special welcome to Bishop-Elect Dale, to Penny, Jacob, Luke and other members of your family. People of St Helena and Ascension, it is a special joy for me and my brother bishops to greet you as we welcome the 16th Bishop of this Diocese. May I also extend a word of gratitude to Bishop Richard Fenwick and his predecessors – most recently, James Johnson, John Ruston and John Salt – for their sterling work in this Diocese amidst the challenges they faced. We can all attest to the fact that this Diocese is alive and has a bright future. Thank you, Bishop–elect Dale and your family, for availing yourself for this special ministry in this part of God’s vineyard. There is much to celebrate today, but before I do, let us acknowledge that today is the one hundredth anniversary of when, as it has been said, on the “11th hour of the 11th day of the 11th month of 1918”, that the First World War finally came to an end. I don't want to dwell on the subject too much, but I have spoken previously of how Margaret MacMillan, a Canadian historian now in Oxford, has written that the war still haunts us today partly because of the scale of the slaughter – 10 million combatants and countless millions of civilians died – but also because experts cannot agree on how it happened, and therefore on how to avoid such a catastrophe in the future. So in the sombre realisation of that, in a time of growing xenophobia and nationalisms across our world, let us pray for the peace of the world. Now to the reason it is especially exciting to be here. A few years ago, I preached at the Bicentennial celebrations of the Parish of St Francis Of Assisi in Simonstown, in the Diocese of Cape Town. That is a parish which was founded in 1814, after the British had taken control of the Cape at the end of the Napoleonic Wars, and established a Royal Navy base in Simonstown, part of whose function it was to guard Bonaparte during the years of his detention on St Helena. At that service in Simonstown, we celebrated 200 years of “faithful service, worship and witness” in the first Anglican parish established on the Southern African mainland. 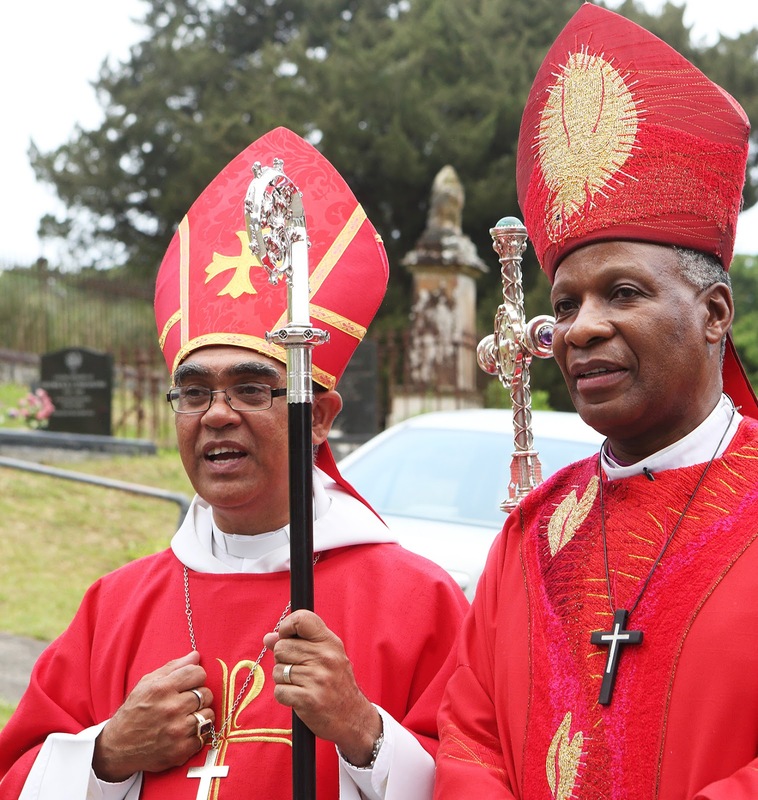 But what I don't think has received adequate recognition, not only on that occasion but in general in our Province, is the fact that Anglican ministry in what we now call the Anglican Church of Southern Africa, began right here on this island, long before the parish was established in Simonstown. You have had Anglican chaplains since 1671, the first St Paul's Cathedral was built long before the first St Francis' Church, and of course St James' Church is famous as the oldest surviving Anglican church anywhere south of the Equator, pre-dating churches not only on the African mainland but also in countries such as Australia and New Zealand. In our Province, you are the 4th oldest of our 28 dioceses, after Cape Town, Grahamstown and Natal. So one reason I and my fellow bishops are thrilled to be here is to give proper recognition to your history as part of our Province and to nearly 350 years of your – and your ancestors' – “faithful service, worship and witness” in these parts. And to sum up our excitement, it of course goes without saying that it is a special joy and privilege to consecrate only the second son of your soil to be Bishop of this Diocese. 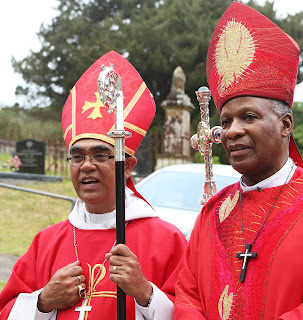 Bishop–elect Dale, you will soon hear that one of your responsibilities will be to represent the Diocese of St Helena to the wider Church and the wider Church to the Diocese. In fulfilling this you have to teach and interpret the truth and thus further the unity of the church, proclaiming the demands of justice in leading God’s people in their mission to the world. Turning to our Old Testament reading today, just as you have been called by God to be Bishop in this Diocese, Elijah was one called by God to be a prophet. He was enjoined by God to follow specific instructions, which – if he conformed to them – would result in action which revealed God's faithfulness to him. In the passage before the account we heard today, God instructed Elijah during a drought to go and live in solitude alongside a brook or stream, from which he would be able to drink, and God would ensure that the birds would supply him with food. Elijah met this test with faith, and waited on the Lord. He did not run away, nor did he go off and do his own thing, nor did he complain in discontent. And God came to his rescue and supplied his needs. Friends, as Jesus says “Anyone who can be trusted in small matters can be trusted also in great; and anyone who is dishonest in small matters is dishonest also in great” (Lk16:10). So in today's passage, Elijah, having been proven to be faithful in staying at the brook, is instructed by God to move out of this place of silence and testing in small matters. God entrusts Elijah with an important new ministry in a new place. Zarephath, the place to which he was sent, was a coastal town located between Tyre and Sidon. It was the time of the reign of King Ahab, who was married to Jezebel, and the territory was ruled by Ethbaal, Jezebel’s father. In fact, Elijah is called by God to go to the heart of the land from which the worship of Baal was being promoted in Israel. As a bearer of God’s word, Elijah is now to be sustained by human hands in the person of a widow facing starvation. This woman is from outside the circles of God’s people – in fact, she is from a pagan nation that at that time represented forces that were against God’s kingdom. Elijah's request that the widow gives him some of her last remaining meal and oil is not an act of selfishness on Elijah's part, but a test of the woman’s faith. Although she is a gentile, she worships God and listens to Elijah. God blesses her abundantly and she and her son are able to eat for many days. People of St Helena, as the faithful gathered here today, what are we doing to demonstrate our faith in God? The widow gave her all; are we prepared to do the same for God’s church and his people? As we welcome our new Bishop, what are we promising for the success of this diocese? Bishop-elect Dale, as Elijah was asked to arise and go to Zarephath and stay there, and the widow was commanded to care for his needs, I say to you today as Archbishop – arise from amongst your equals, take charge of this Diocese which you already know well, and God will provide for you. In Him you will never be found wanting. In Mark's Gospel today, we also heard how Jesus commended the poor widow for her giving to the treasury – for she gave all that she had to live on (Mark 12:44). Her action in giving all she had came against the backdrop of a society in which widows were especially vulnerable to exploitation. Friends, what matters before God is your willingness to give, which is the true mark of generosity, no matter how small the amount that you can afford. Giving is pleasing in the sight of Jesus and if we are humble and sincere in it he will graciously accept it. Those that have but little ought to give of their little. Those that live by their labour need to give to those in need. This is loving our neighbours as ourselves – what I call working for the common good. Even if we can give just a little in charity, if we give according to our ability and in the right spirit, it is welcome to Jesus – who requires giving according to what we have and not what we don't have. In ACSA, we cooperately commit to be Anchored in Christ as revealed in scripture, Committed to God’s mission with compassion and joy and Transformed by the Holy Spirit through discipline and worship as our vision seek form, inform and transform in response to God. And so dear people of the Diocese of St Helena I urge you today, as Paul did to the churches in Macedonia whose giving in their deep poverty was commendable; give not only to your power, but beyond your power for the good of this Diocese. When we can cheerfully provide for others, as the widow of Zeraphath did for Elijah, and trust God to provide for us in the same way, this will be appreciated before God. In conclusion, as we welcome our new Bishop let us resolve to give and do more for the completion of the good work that our former bishops have started. God loves you, so do I.